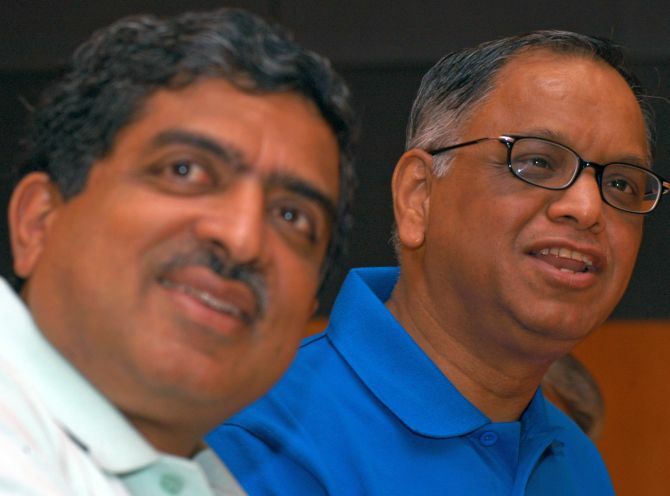 Hours after taking charge at Infosys, Nandan Nilekani on Friday described N R Narayana Murthy as an iconic figure who he said helped the company set high standards of corporate governance. The Aadhaar architect -- who was on Thursday night named the new chairman of the country’s second-largest IT firm -- acknowledged that he is an “admirer” of Murthy, saying the “iconic visionary” is the father of corporate governance in India. “Many good practices (of corporate governance) including full disclosures and transparency, SEC filings... were spearheaded by Infosys. I will ensure Infosys, Murthy and the founders have a healthy relationship,” Nilekani told investors on a conference call on Friday. Infosys will be a board managed company with high standards of corporate governance, he asserted, vowing to restore its former glory. Nilekani’s relationship with the founders, especially Murthy, will be critical in light of nearly a year-long acrimony between the promoters and the board that resulted in the sudden resignation of CEO Vishal Sikka and a board rehaul. Infosys has been in crisis over the last few months, with the promoters alleging corporate governance lapses and flagging the $200-million Panaya buyout. Nilekani said his appointment was a “unanimous” board decision and Murthy too was “supportive” of his coming in. He, however, dodged a specific query on whether Infosys will withdraw a scathing statement, issued by the board on August 18, to the stock exchanges. The statement blamed Murthy for carrying out a “misguided” campaign that led to Sikka’s resignation. Instead, Nilekani promised that he will look at the entire gamut of issues and resolve them to the “satisfaction of all parties”. Alluding to the difficult task cut out for him in bridging the differences, he highlighted his past roles as a “consensus builder”. He cited the example of India’s mega biometric project Aadhaar -- which today has over a billion citizens enrolled -- saying the project was initiated by one government and carried forward by another. “My job has been consensus building... I assume that people will see me as a unifier. I will bring those skills I have,” he said. “Alignment of views among all stakeholders, including institutional investors, the founders, the board and the management is the need of the hour,” he added. People close to the founders, who are also believed to have pushed Nilekani’s case, said his credibility and political capital will help him act as a conduit between the management and the founders. He is also seen as someone who the co-founders, led by Murthy, would listen to and one who can restore order in the troubled company, they said. Nilekani recalled that Murthy had given him a job at the start of his career. In 1981, Nilekani joined Murthy and five engineers who set up Infosys with a mere capital of $250 (Rs 16,000). The company today has grown to be an over $10-billion (Rs 64,067 crore) technology behemoth with global clientele spanning the US, Europe and other markets. Nilekani served as Infosys CEO between 2002 and 2007 and later as co-Chairman on the board for the next few years. Is this why Sikka quit Infy? Lesson from Infosys: Fear the founder!